Personalisation included in the delivery price on this item. 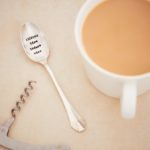 A vintage silver plated spoon hand-stamped with ‘Coffee now Champagne later’ onto the spoon face. 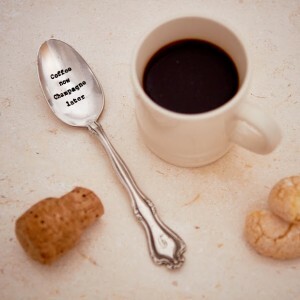 A great coffee spoon to remind us that we must drink coffee first before it’s acceptable to drink the bubble later. The perfect gift for the coffee (ahem…Champagne) lover. 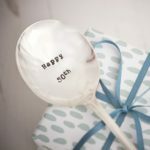 Our full range of vintage cutlery can be personalised for you or your loved one making it that extra bit special. 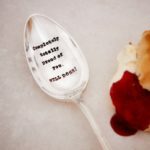 Simply select the delivery option which costs £6.95 and we will personalise your spoon and deliver to your chosen address for free. For further details and to find out more, please contact us. All of our cutlery is silver plated and vintage. It is then lovingly hand stamp with sentimental and witty quotes creating a timeless keepsake from a piece of our history! As the cutlery has had a previous life signs of it’s history may be visible adding to it’s unique charm and beauty. *Because of the individual nature of each piece, we cannot guarantee that the piece will look exactly the same as in the picture.